Valve revealed Thursday that Steam, its digital distribution service for games, will launch a Mac OS X version on Wednesday, May 12th. With over twenty-five million users and hundreds of games at its disposal, Steam is a gaming marketplace that allows players to purchase and download games completely digitally. In addition to bringing Steam to the Mac, Valve has also promised to bring over its "Source" gaming engine and a number of the company's popular titles, including Team Fortress 2, Counter-Strike, Portal, Left 4 Dead 2, and the Half-Life Series. 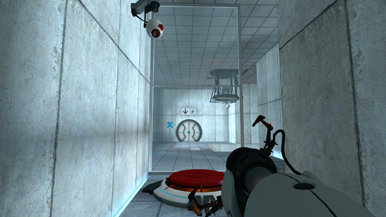 Portal is an innovative puzzle game that involves jumping through inter-dimensional portals. Cake will be served. Valve declared in March that it would be bringing Steam to the Mac platform in April, but a delay seemed likely given the ambitious nature of native development. Steam is currently in a closed beta, with Portal being the only title currently playable on the Mac. Representatives from Valve previously stated that they specifically wanted to go with native development solutions and not just emulation. After looking at Portal on my iMac I can see why they made that decision. The game looks gorgeous, and although Steam is only in beta, Valve seems to putting a lot of effort into making sure the many functions of the service—digital distribution, achievement, friends, and so on—run smoothly. Mac gamers have longed looked forward to the service's appearance on Mac OS X, as none of Valve's games are currently available for the Mac unless players use Boot Camp or own a separate Windows PC. In March Valve also announced that game licenses can transgress platforms, so that any game that you purchased for the PC will also work once it comes to the Mac, with no additional fees. Steam is a widely-popular gaming marketplace whose appearance on the OS X platform can only mean great things for Mac gamers. Not only will Steam be offering some of the best titles Valve has to offer, but previous press releases indicate the service will bring many third-party developers to the platform as well. For Mac gamers, May 12th can't come soon enough.